Towns of Myrhorod and Chortkiv have approved cycling concepts, and in the city of Dnipropetrovsk new cycling paths have appeared. Myrhorod (Poltava region) has been developing the cycling concept since 2015 in cooperation with experts from Ukrainian information center of cycling using a German technique. According to the plan, by 2020 in Myrhorod 20 cycle routes will have been built and they are going to spend 30 million UAH on them. In general, according to the count of cyclists carried out by cycling volunteers in 12 cities of Ukraine in April and September 2015, Myrhorod is one of the most cycling cities in Ukraine. During 1 hour at 17 points they counted 2622 cyclists, 35% of which are women. Cycling volunteers of Chortkiv (Ternopil region) developed a cycle concept in 2015 on their own. They plan to establish 7 cycle routes on the most important streets of the town + several recreational parks. The budget of the cycle concept, which is 110000 UAH, aims primarily at organizing cycling promotion events. 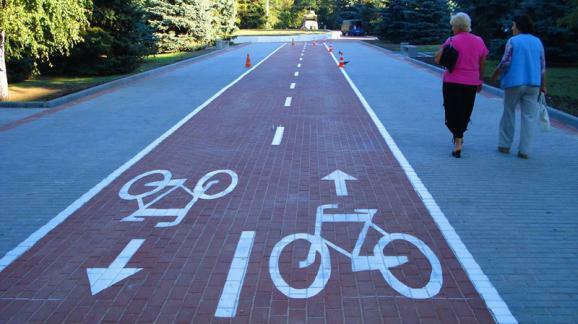 And in Dnipropetrovsk in 2015 the first kilometer of cycling route was opened. The city authorities promise not to stop and to continue building cycling infrastructure. And officials meanwhile promote an active lifestyle coming to work by bikes. The creation of bicycle paths in Dnipropetrovsk is carried out by the Department of Housing together with cycling volunteers of the city.